Since our bases overseas are US territory, the postage will cost the same as if you were mailing to an address here in the US. 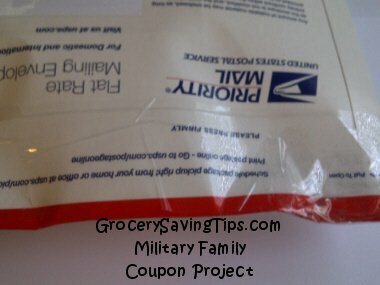 Clipping the coupons before mailing will also help you keep the costs down. The post office may request a specific contact name when you go to mail your coupons. If necessary, explain to them that we cannot maintain a list of personal contact names because they CHANGE constantly and that we are a volunteer group donating grocery coupons to help our military families stationed overseas. The postal worker can also open and inspect the package if that will help and verify that the contents are grocery coupons being sent to our U.S. commissaries overseas. You may wish to leave your package unsealed until you get to the post office. However, we have not experienced this problem and have never had a package of coupons returned. Note: The APO/FPO is used for the "City" and AA/AE/AP is the "State"
"Before I retired, I worked outside the U.S. in a Family Support Center for the military and we were always glad to receive coupons at our installation. You can send them to the military installation to the attention of the Commissary. You could also send them to support organizations such as the Air Force Family Support Center, Navy Family Services or Army Community Services, etc. Be sure to write "Coupons" on the outside of the envelope. If you send them overseas, you will need the name of the installation plus the APO or FPO. - Yvonne"
"I'm new at sending my coupons to our overseas troops and it would be helpful if in the directions of "Label Addressing" to remark that APO/FPO is used for the "city" and AA/AE/AP is the "State." This would be very helpful, especially for those who like to do their labels online. Also, when I went online to fill out the customs form it required a phone # for the Addressee. Do you have a list of phone #'s or is this really a requirement? - Sherri"
Note: The tape on the flat rate envelope pictured above was not used to seal the envelope, it was only added for extra strength. This was the first flat rate envelope we used to ship coupons overseas. Since then, we have not added the extra tape as it is not needed.